Yamaha CRX-N470D review | What Hi-Fi? If, as a child, you bolted toward the Woolworths pick ’n’ mix with any other mentality than that of cramming at least one of everything into a paper bag, you were doing it entirely wrong. However, there are still alternative means to satiate that innate human desire for variety and abundance. One such offering takes the shape of Yamaha’s CRX-N470D, a mini hi-fi system with more features than a Dr Dre album. 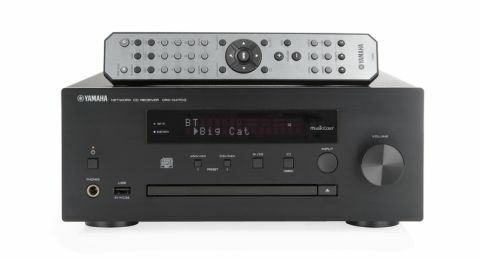 There’s a healthy abundance of the more traditional – a CD player and FM and DAB digital radio, as well as USB, RCA and 3.5mm analogue inputs – washed down with Bluetooth, AirPlay, wi-fi and DLNA, internet radio, Spotify Connect and Qobuz for all your wireless needs and wants. But the function Yamaha offers that its competitors cannot (due to it being a proprietary technology) is MusicCast. Effectively that’s shorthand for the ability to connect multiple of the company’s hi-fi and A/V products to work in unison. In the case of a mini-system such as this, it’s made particularly freeing by the fact that, in theory, you’re no longer restricted to traditional stereo speakers to make it sing. We do connect traditional speakers to the CRX-N470D, however ­– a pair of Q Acoustics 3020s –and begin playing a CD of Explosions In The Sky’s The Wilderness. There’s a comforting, analogue warmth to the synthesisers that open the record, and the Yamaha comes across as a tender, sympathetic performer. The level of detail, as other instruments join and echo, is satisfying. We’re welcomed with a sense of the CRX-N470D’s scale as the soundstage opens at the crescendo of this opening track around three minutes in. It’s reassuring that the only diminutive aspect of the system is its physical stature. The sense of timing and dynamics means the Yamaha is able to portray the more boisterous character of later tracks such as Tangle Formations and Logic of a Dream. There is a vivid understanding of the atmospherics of the record, which the CRX-N470D manages to render without division. The system is bettered sonically when we switch to Denon’s Award-winning D-M40DAB, though. Most noticeable when playing an album with vocal depth, in this case Savages’ Adore Life, the Denon offers a more acute appreciation of subtle dynamics that elevates the performance in terms of character and expression. The Yamaha is by no means lethargic, but it doesn’t capture the momentum or the animosity in Jenny Beth’s voice quite so well. The Denon’s performance is more urgent than the Yamaha manages – acrimonious even. It’s perhaps not such an easy listen in absolute terms, but one more befitting of the character of the record. Arrangements seem better organised with the Denon too. While there’s probably more space to work in the Yamaha’s soundstage, the instruments aren’t quite as well tethered one to another. Again, the CRX-N470D dishes out a cohesive performance, just one perhaps not quite as adept as its Award-winning rival’s. We wouldn’t give too much consideration to the price difference – you can take home Denon’s matching speakers for the same price as the CRX-N470D – because it’s somewhat offset by Yamaha’s bonus functions. In an era of multi-room, the benefit of MusicCast cannot be overlooked. But the sonic benefits of the D-M40DAB marginally outweigh those of its rival. Regardless, the CRX-N470D is a particularly adept performer with a plethora of features that offers foundation for a hi-fi system with plenty of scope to grow.